The Residency Program in Primary Eye Care at Ochsner Medical Center provides qualified optometrists with advanced clinical education in the diagnosis and management of eye and vision problems encountered in a primary care practice. GOAL 1: Strengthen the resident’s expertise in the diagnosis and management of visual disorders and ocular disease. Objective 1: The resident will complete a minimum of 2000 patient encounters with patients presenting with vision disorders and ocular disease. The demographics include children, adults and geriatric patients. Outcome: The resident will develop advanced expertise in management of patients with visual disorders, retinal disease, glaucoma, anterior segment disease and neuro-ophthalmic disease. Measure: The resident will report monthly on the number and type of patient encounters using the patient encounter log and summary forms. Objective 2: The resident will perform the proper diagnostic procedures. GOAL 2: Enhance the resident’s basic examination skills. Objective: The resident will develop a high degree of efficiency in the provision of optometric services. GOAL 3: Expand the resident’s knowledge of specialized diagnostic procedures and instrumentation. Outcome: The resident will perform ophthalmic ultrasonography (A and B-scans) and interpret the results. Objective 2: The resident will develop expertise in ophthalmic fluorescein angiography through observation and interpretation. Outcome: The resident will observe fluorescein angiography and interpret the results. Outcome: The resident will perform fundus photography on at least 20 patients. Objective 5: The resident will develop expertise in ordering and interpreting relevant medical laboratory procedures. Outcome: The resident will order laboratory procedures on at least 10 patients. Objective 6: The resident will develop expertise in performing and implementing corneal topography. GOAL 4: Expand the resident’s knowledge in the care of refractive patients. Objective 1: The residency will develop experience in evaluating patients for advanced refractive care including contact lens care, low vision services and refractive surgery. Outcome: The resident will provide advanced refractive care to a minimum of 100 patients. Measure: The resident will report monthly on the number of patient encounters of this type using the patient encounter logs and summary forms. GOAL 5: Increase the resident’s knowledge of systemic disease and their treatment. Objective 1: The resident will acquire additional knowledge of systemic disease and treatment, particularly those systemic diseases with significant ocular manifestations. Outcome: The resident will participate with non-optometric providers in management of patients with systemic disease. The resident will attend bimonthly Ochsner Ophthalmology Grand Rounds on systemic disease. Measure: The resident will report monthly on the number of patient encounters and participation in conferences of this type using the patient logs and summary sheets. Outcome: The resident will present at least one lecture per year at Southern College of Optometry, one grand rounds at Ochsner Clinic and when possible present posters or lectures in other settings such as the American Academy of Optometry and SECO. Measure: The resident will report monthly on these types of activities using the residency activity summary. Objective 1: Educate the resident in the preparation of a professional manuscript. Measure: The resident will complete the manuscript by May 1. GOAL 8: To provide the resident with the opportunity to become an effective clinical educator. Objective 1: The resident will supervise optometry student clinicians in provision services to patients, and provide quarterly lectures to optometry students. Goal 9: The resident will acquire a practical understanding of patient coding, billing, and practice management in a primary eye care clinical setting. Objective 1: The resident will acquire a practical understanding of patient coding and billing in a primary care clinical setting. Measure: The results of regular review of the resident’s billing/encounter forms by the Supervisor or attending doctor at Ochsner Medical Center will be reflected in the quarterly resident evaluations. Objective: The resident will develop a high degree of proficiency in optometric services to patients with vision disorders and ocular disease. 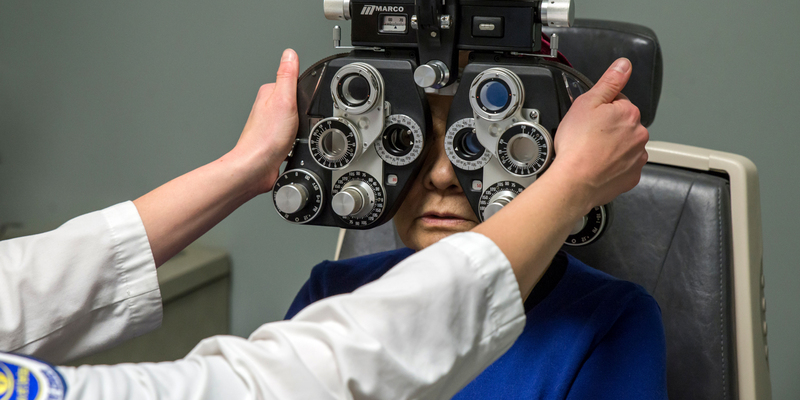 Learning Activity: The resident will provide optometric services involving a minimum of 2000 patient encounters to patients with vision and ocular disease. Outcome: The resident will develop advanced skills in the management of patients with vision disorders and ocular disease. Objective: The resident‘s basic examination skills will be enhanced. Learning Activity: The resident will perform a case history, measurement of visual acuity, refraction, tonometry, and assessment of external and internal ocular health during a single patient encounter a minimum of 1000 times. Outcome: The resident will become highly efficient in the performance of basic ocular examination techniques. Learning Activity: The resident will perform and/or interpret ophthalmic ultrasonography, ophthalmic fluorescein angiography, fundus photography, optical coherence tomography, Heidelberg retinal tomography, relevant medical laboratory procedures and corneal topography. Objective: The resident will provide care to a large number of patients interested in contact lenses, low vision aids and refractive surgery. Learning Activity: The resident will evaluate and counsel patients interested in contact lenses, low vision aids and refractive surgery including follow up / post-operative care. Outcome: The resident will become experienced in providing advanced refractive care. Objective: The resident will become familiar with the management of systemic diseases commonly associated with ocular disease. Learning Activity: The resident will consult with patients’ physicians when appropriate to coordinate the management of related ocular and systemic conditions. The resident will attend bimonthly Ochsner Medical Center Ophthalmology Grand Rounds. Outcome: The resident will be able to communicate effectively with physicians in the co-management of patients who have systemic disease that impacts their ocular health. Learning Activity: The resident will present at least one lecture per year at SCO and one at Ochsner Medical Center Ophthalmology Grand Rounds and when possible will present posters or lectures in other settings such as the American Academy of Optometry and SECO. Objective: The resident will supervise optometry student externs in the provision of patient care. Learning Activity: The resident will mentor and oversee the optometry students during the final nine months of the residency and present quarterly lectures to optometry externs. Outcome: The resident will develop skills in providing effective clinical education. The Resident will gain clinical experience in the Ochsner Medical Center Main Campus and in external clinics affiliated with Ochsner. The resident will meet on a weekly basis with the residency supervisor for discussion of current cases. The exact schedule for these rotations will be determined by the program supervisor. Ochsner Medical Center Ophthalmology Grand Rounds presentations, typically emphasizing ocular disease, are presented bimonthly. The resident will participate in the Southern College of Optometry Residents’ Day, during which all residents in programs affiliated with the College present clinical presentations to faculty, practitioners, and other residents. The resident will be involved in occasional student supervision if teaching is deemed a career goal. D. Applicant must pass all parts of the National Board of Examiners in Optometry examinations required for Louisiana license and furnish official transcripts when available. If accepted, the resident is expected to obtain a Louisiana optometry license. The residency program is fifty two weeks in length from September 1 to August 30. The stipend is $39,000. Compensation is not contingent upon productivity of the resident. Professional liability insurance is provided by Ochsner Medical Center. A continuing education allowance of $500 is also provided by Ochsner Medical Center. Also, Ochsner will provide clinic coats and a digital pager/phone. One week of educational leave, one week of sick leave, one week of vacation leave are available with prior approval of the Supervisor and the SCO Director of Residency Programs. Additional educational leave may be allowed at the discretion of the above individuals. The resident is required to write a paper based upon original research, literature review, or a clinical case suitable for publication in a refereed optometric journal. This paper is expected to be completed prior to May 1. The resident may be allowed to provide patient care services outside of the Ochsner Medical Center system on a limited basis only with advance written permission by Ochsner Medical Center residency supervisor. A. The resident is required to deliver clinical services at a level which is satisfactory to the Residency Supervisor of Ochsner Medical Center, Director of Residency Programs, and the SCO administration. The office is open from 8:00 A.M. until patient care is completed, usually around 5:00 P.M., Monday through Friday. On call services are required after one month of training. B. The resident will be required to keep a record of patient contacts. Cases will be reviewed periodically by the Residency Supervisor or Ochsner Medical Center and the Director of Residency Programs when appropriate. C. The resident will be required to write a paper based on original research, literature review, or a clinical case suitable for publication in an acceptable professional journal. E. The resident will be expected to perform in a professional manner in the delivery of patient care services and to observe those proprieties of conduct and courtesies that are consistent with the rules and regulations governing Ochsner Medical Center. F. The resident will be expected to assist in the continuing education programs provided at Ochsner Medical Center. G. The resident will be required to participate in and complete the requirements set forth in the curriculum. The residency program in Primary Care Optometry at Ochsner Medical Center is fully accredited by the ACOE, 243 N. Lindbergh Blvd., St. Louis, MO 63141, 314-991-4100. Upon evidence of satisfactory performance in meeting all requirements of the program, the resident will be awarded a Certificate of Completion.